Light Therapy for Acne: Does it Work? Who Is Acne Light Therapy For? How Much Does Acne LED Therapy Cost? Does Light Therapy Work on Acne Scars? Light therapy uses red and/or blue LED lights to treat and prevent acne. Blue light may kill the bacteria responsible for acne, while red light may reduce the skin’s oil production. Light therapy is most effective for mild to moderate cases of acne. There are now FDA approved at-home light therapy devices, but there is not yet enough data to say conclusively that they work. Acne vulgaris affects about 45 million Americans and about 90% of adolescents or young adults. While it is most prevalent during the teenage years, many continue to suffer breakouts well into adulthood. Photodynamic therapy is a recent development in the treatment of acne that involves exposing the skin to red or blue LED lights. The Federal Drug Administration (FDA) has approved certain blue and red light therapy devices for the home market. In this article, we explore what is involved and what the current medical research says about this new treatment. 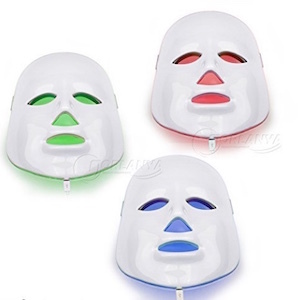 Light therapy is a treatment modality for acne using red and blue LED lights. The light penetrates the skin, eradicating some of the acne-causing bacteria and thereby reducing inflammation. While it may help with mild to moderate cases of acne, it has little effect on severe cases, especially those involving nodules and cysts. By killing the bacteria and reducing inflammation. By reducing the amount of oil your skin produces. Light therapy uses either blue, red, or a combination of blue and red lights. Blue light exists on the light wavelength spectrum from 407 to 420 nm. It converts porphyrins, a substance that acne-causing bacteria produce, into a form which can kill the bacteria. A study published by the Journal of Dermatological Treatment indicates that patients with mild to moderate acne who received eight 10- or 20-minute narrowband blue light treatments over 4 weeks saw a significant decrease in the number of inflamed lesions. Red light, which exists on the spectrum at 700 nm and above, can penetrate the skin more deeply and reduces acne by shrinking the size of the sebaceous glands, which are responsible for producing the oil that lubricates the skin. When the glands become smaller, they produce less sebum, which may result in less acne. Photodynamic (light) therapy works best for mild to moderate cases of acne characterized by redness, papules and pustules (commonly referred to as pimples). It far less effective on inflammatory acne, nodules, and cystic acne. Light therapy is a relaxing treatment that involves sitting in front of or lying under an LED light panel in a dermatologist’s office for 30 minutes per session. The procedure is non-invasive, enabling patients to return to work and normal activities right away. Patients are advised to stay out of the sun for a few days following the treatment, especially if they are also using other acne medications such as benzoyl peroxide, retinoids, salicylic acid or doxycycline. The FDA has approved light therapy devices for home use. While these devices are less powerful than the ones used at the dermatologist’s, they can be a more affordable option. Although there have been studies published in the Journal of Clinical and Aesthetic Dermatology in 2009 and 2016 yielding positive results on these devices, there is not yet enough data to conclude that they are effective as an acne treatment. For this reason, the American Academy of Dermatology cautions to remain skeptical about at-home light therapy devices. It also advises all patients seeking treatment for their acne to consult their dermatologist. At-home light therapy devices come in two flavors: handheld devices and hands-free devices. This device uses blue and red lights and is capable of applying both at the same time. It also has an automatic timer, allowing it to turn off after the appropriate amount of time for a treatment. It is FDA-approved for the treatment of mild to moderate acne. The MD Blue emits blue light only. By holding it to the skin, you can glide it in circular motions over the affected area. Its LED lights are long-lasting, rated for 50,000 hours of use. The Norylana device uses red and blue lights, emitting only one color at a time. It is comprised of panels that emit LED light and are large enough to be used on the back as well as the face. 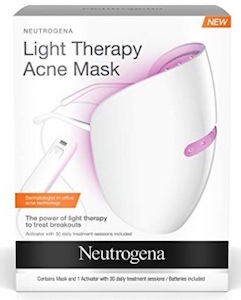 Neutrogena’s device is unique in that it comes in the form of a mask that can be applied to the face. 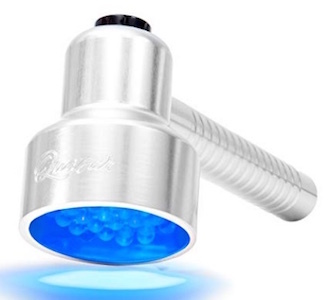 It uses blue light only and has a replaceable activator that is good for about 30 treatments. It is relatively cheap, costing about $35. A visit to the dermatologist typically costs between $40 and $150, and a full round of therapy might cost as much as $1,500. At-home light therapy devices range between $35 and $350. Doctors advise that you should not receive light therapy if you have certain forms of cancer or epilepsy. You should also avoid LED skin treatments if you are on Accutane or antibiotics. For obvious reasons, you should stay away from these devices if you have light sensitivity (photophobia). Unfortunately not, since neither red nor blue light is strong enough to penetrate the skin deeply enough to affect the appearance of acne scars. Dermatologists recommend treatments such as peels and skin resurfacing with lasers for acne scars. Light therapy administered in a doctor’s office has shown some success in reducing redness, inflammation, and lowering the incidence of breakouts in patients with mild to moderate acne. Treatments are usually performed once or twice a week over a period of four weeks. However, its effects are not permanent, requiring subsequent rounds of treatment. The results and benefits of the treatment vary from patient to patient and can be quite costly. FDA-approved at-home light therapy devices may be a cheaper, more affordable option, but they are not as strong as the machines dermatologists use, and their effectiveness in reducing breakouts has yet to be conclusively confirmed. Should you opt for at-home devices, you must use them daily as part of your normal skincare routine. While neither light therapy at your doctor’s office or via an at-home device will guarantee you results, studies suggest that physician treatments are more effective overall.